Pavel Chekov, son of Andrei Chekov, was born in Russia on Earth in 2245. Pavel was an only child. Around 2263, Chekov entered Starfleet Academy, from which he graduated with the rank of ensign. His Starfleet serial number was 656-5827D. During the early 2260s, Chekov was romantically involved with Irina Galliulin while they both attended the Academy together. The two had several disagreements before they parted ways: Chekov believed Galliulin to always be too free-spirited, Galliulin believed Chekov to have always been rigid. When Galliulin dropped out of the Academy, each accused the one of leaving the other. Chekov left, but came back to look for Galliulin, who was at the time staying in the city with friends. Galliulin eventually joined the counterculture movement of Doctor Sevrin and his search for the mythical planet Eden. Chekov's first assignment, at the age of 22, was on the USS Enterprise under command of Captain James T. Kirk. He joined the crew sometime prior to the spring of 2267. 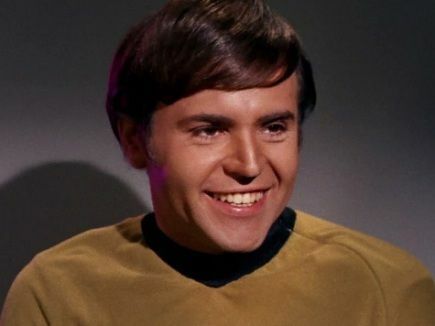 Chekov served a standard junior officer rotation, eventually earning the post of navigator, although he was also proficient with the science officer station, often serving at the post in Commander Spock's absence. While acting the role of science adviser, Chekov made every attempt to be as thorough as possible. While investigating a humanoid that could generate and control energy, who referred to himself as Apollo, in 2267, Chekov began to spout off information on similar creatures. After naming the electric eel and giant dry-worm, he was stopped by Chief Medical Officer Leonard McCoy, who told him "not the whole encyclopedia, Chekov." McCoy later quipping on Chekov's dedicated thoroughness by stating: "Spock's contaminating this boy, Jim." After arriving in 2379 Chekov found himself moved to not only Assistant Chief Navigator but Chief Navigator after Ilia was reassigned to the Lexington and Stiles was killed by a Jem'Hadar.